In:Quality has launched its ipDTL 3rd Anniversary Upgrades Remote Recording Voice Over Solution. 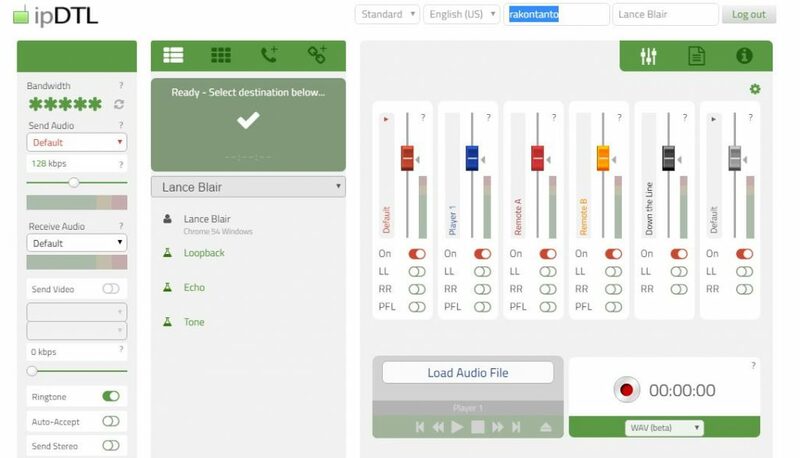 As a result of the new upgrades and features, ipDTL becomes the here-to-stay complete remote recording solution for live-directing of voice over sessions. The new Silver subscription allows 2 simultaneous connections of low-latency broadcast-quality audio and the Gold subscription makes 4 connections. Most of all, it lets you connect to anything: ip, ISDN, land lines, and mobile phones. And, in a first for ip voice over products, one can record the incoming audio as mp3 or wav files! Here’s a .wav sample of one of the many recent tests I ran of the beta version of the upgrade. I’m joined in the test I recorded within ipDTL at my Atlanta studio by Jan Anderson from the San Francisco Bay Area and Andy Kavanagh from Newcastle in the United Kingdom. 2. Lower latency with two simultaneous connections: with an additional option for four simultaneous connections in the premium studio versions. 5. The ability to record the incoming audio and download as separate takes either as a high-resolution .mp3 or as a 48 kHz 16 bit stereo .wav file. 6. Live chat feature which will keep all parties connected online even if the audio or video connection is dropped. 7. Live collaborative script editor. Paste in your entire script from word! 10. With “Tel +” you can connect to land and mobile phones and call ISDN lines. Standard Tel can only receive ISDN calls. Maroon fader controls the first ipDTL user you connect to. Orange fader controls the second ipDTL user you connect to. Finally, the Silver fader controls the mixed feed to the ‘Receive Audio’ device. It doesn’t include the audio you send down the line. There will always be very good reasons to use ISDN for many applications. Live broadcast events springs to mind. However, as a production solution for live-direction of remote session voice overs, ipDTL is all-encompassing. The ipDTL 3rd Anniversary Upgrades Remote Recording Voice Over Solution is a comprehensive solution for media production: voice overs, music production, interviews, podcasting, and mult-party voice acting. Because so many remote sessions are being done by producers on their cellphones or in conference calls, don’t settle for Skype to interface with. Skype doesn’t cut it. Classic phone patch doesn’t cut it. The audio is terrible. How many times do you have to ask the talent “Um, I’m not sure if you said the plural S on the end of the product name in the fifth line?” Yet that won’t happen with ipDTL. It’s been years since Skype promised a high-quality audio “Skype TX” and it was never delivered. In conclusion, ipDTL has been good on its promises to improve every year and listen to the demands of the media production people that use it all over the world. As a result, the ipDTL 3rd Anniversary version delivers on being the complete remote recording voice over solution.